Ham or smoked sausage is perfect with cheesy hash brown casserole. The problem is that if you place the ham in the slow cooker with the casserole, the flavor will overpower everything else. This little trick of using a foil packet for the meat, and placing it on top of the potatoes works great! One pot dinner, that keeps the flavors separate. 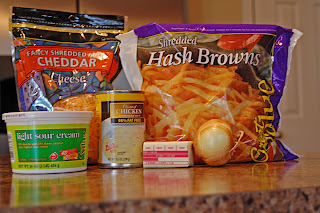 This hashbrown casserole can be baked in an oven or done in the crockpot. It can even be frozen and baked another day. Place ham or sausage in foil on top of potatoes, if you are making meat. Bake in an oven at 350 degrees for about 1 hour. Or cook in the slow cooker 5-6 hours on high or 7-8 hours on low. I know that looks pretty messy. I just mixed the ingredients right in the crockpot. I wanted to have this with ham, but didn’t want the smoky taste to go through the potatoes too much so I used a trick I learned on Crockpot 365. I made a foil packet with the ham in it and placed it on top of the potatoes. Both foods cooked perfectly and the flavors didn’t mingle during the cooking. Chicken Casserole – lightened up! Great idea! I also read Crockpot365, but missed that tip. Thanks! Perfect idea and it turned out great. I dont remember that tip either. I guess that makes three of us. The crockpot tip actually came from a recipe she shared for steak, baked potatoes and corn on the cob. The steak went in the bottom with a bit of liquid and seasonings. The potatoes and corn on the cobs were individually wrapped in foil and placed on top of the steak. It works great. All the foods have their own flavor. Tiffany, was this a beef roast? And how long did you bake it or crockpot it? I think it was a steak, but you could do it with a roast or any cut. Usually 5-6 hours on high or 7-8 on low should work. that looks so yummy…I think Juice would love it…. This looks scrumptious… and I think my family will enjoy it.. Thanks for stopping by my blog. Yep coupons are great… I am addicted to them. about the trick with the ham. Thanks for sharing!! Cool trick with the foil packet. Who would have thunk it? I’ll definitely be trying that! How long did you cook these in the crock pot? This is such a great idea!!! I am totally going to make this later in the week! I bet my kids would love this. I am about to go to the grocery store and was looking for some easy meal ideas for the week. Sounds delicious! My men will love this dish. Tiffany this looks just delicious and so easy (I am all into easy). I am going to make this recipe this week. That looks super yummy. I might have to give it a try! I’ve made the hashbrowns before and they are good. I love the ham tip! Ummm..Yum. I am a big Crockpot fan! Thanks for visiting me on my big, bloggy day! I’m gonna have to get a crockpot now thanks to you and your yummy recipes! Thanks for stopping by my blog! 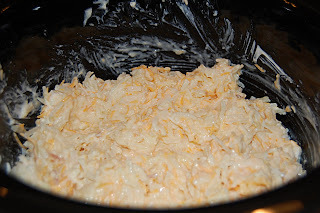 Oh man, hashbrown casserole is one of my favorites! In a crockpot…even better. This looks so great! I am really glad you left a message on my blog that led me here. I have bookmarked yours. Love the recipes! How long did these cook in the crock pot. I have one that seems to burn everything. I have learned that if I put it on low when I leave at 7 & the husband cuts it on warm when he comes home at 12 then by 6 it is perfectly cooked but didn't know if these would burn doing that. I think if that’s what works with your crockpot, that method would work with these. They really don’t need much cooking, so low to warm should work. I would love to try making this in my crockpot. Great idea! I made this casserole and it was wonderul thanks for sharing the recipe Tiffany. My husband and son loved these hashbrowns. I think they were a little overdone in the crockpot as I left them all day. I think they would have been delicous at only 4 or 5 hours!! Just made this today in the crockpot and it didn’t look very appetizing, more like mush. Maybe reducing the butter would help. I didn’t check it and after 4 hours it was burned and the sausages overcooked. If you do this in the crockpot…how long do you let it cook? Christa, 5-6 hours on high or 7-8 hours on low. I’m making this casserole for the third time today. It was a big hit for Easter and Christmas. Today is the first time I’m adding a ham packet. We froze leftover Christmas ham, and I think this is a good use for it for tonight’s dinner! One suggestion I have is to spray your crockpot with non-stick spray (if you don’t use bags) when you make this casserole. What size package of hash browns do you use for this? It sounds delicious!! I think it’s about a 32 oz package. I recently found this website and absolutely in love with every meal for the first week. Just wish I knew how many calories was in each… and if there’s a low cal site. Thanks for all your effort! Hi….one question I think the shredded hash brown is only state side,cannot get these in uk. Is there an alternative? Thankyou!! Gwen, do they have the cubed kind? Those work too. This may sound silly but do you mix everything together after it has finished cooking? Becky, no, it all gets stirred together before cooking. Sure did feel weird squishing the stuff together but you got to live! I am assuming you can put the ham in the foil packets on top of the hash browns if I do it in the oven? If so, would the time be the same? Unfortunately my crockpot lid just broke, so it’s oven time for a bit. Thanks for all your great recipes & tips! Debra, yes, you can do that. In the oven, since it doesn’t bake as long, you can skip the foil if you want. I just don’t like the ham or sausage flavor to permeate the potatoes the way it will in the crockpot. Not as big of an issue in the oven. How large of a ham did you use in this recipe to feed 6-8 people? Thanks! About 2 lbs. of ham should be enough, I think. I made this this past week and everyone loved it-to quote “this is the bomb”. I wanted to use the O’Brien potatoes but, being expensive to feed 7, I bought the regular and cut onions along with green and red peppers form our garden. I also used a can of the garlic roasted mushroom soup and added some Parm. cheese to the mix. 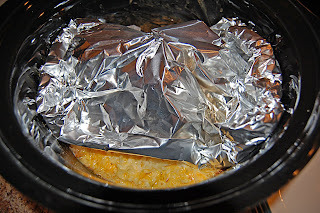 Were you able to put the cover on the crockpot when you added the foiled ham on top of potatoes? Yes, but you do need a pretty large crockpot. Mine is 6 quart. Can you do this with bacon? I haven’t tried it. I don’t know that it would get crisp in the slow cooker though.